Fero’s capabilities are broad ranging and cover a number of different industry sectors. It’s easy to think that a cost down situation is only possible when sourcing offshore. At Fero, we love to look at a client’s assembly process and find ways to create a cost down. There are various ways in which we can and have achieved this for our customers. We are often able to source cheaper materials than our customers because we can buy in bulk and use the materials across a wider range of customers. We have a broad range of suppliers offshore who often provide us with lower cost materials. We use our offshore manufacturing capabilities to provide cost down. By producing wiring looms in China, we can pass on the benefits of lower material and labour costs whilst still taking responsibility for delivery and quality. We enjoy working with customers to determine and manage a number of their hidden costs. For a number of our customers we have successfully provided our own labour resource to allow them to reduce their headcount. For others we have taken over stock maintenance of their raw materials so they don’t have to. We can provide purchasing solutions to lower the time spent purchasing. And most effective of all, we often find customers a simpler, more efficient assembly process which requires less skilled labour. Creating and producing wire looms or harnesses is at the very core of our business and we often find we can use this experience to deliver a more reliable outsourced solution. 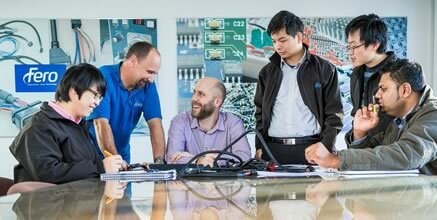 Our engineering team has worked across a multitude of wire harness solutions, with applications in almost every industry, so we tend to understand your requirements and certifications. 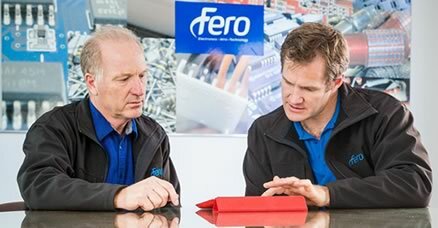 Fero has invested heavily in automation and machinery so that we can offer our customers a reliable, consistent product, each and every time. Our totally repeatable processes remove a large portion of the human element from the manufacturing process. For example, instead of hand-crimping, measuring and cutting, we have machines that automate these processes and integrate checks into the process, so you’re assured of a consistent product every time. We understand that reliability and flexibility form the backbone of manufacturing, so we place a great deal of emphasis on our QA department, providing them with all the testing tools they need to fully test and approve wiring looms prior to despatch. Our process team is fully trained to provide very specialist skills, so that they have an intimate understanding of cable and wire harness assembly and are able to focus on doing this job to the highest standards. They take an immense pride in delivering a quality product and we take pride in the fact that many of our team have been with us for well over 5 years. At the very heart of our culture is a focus on constantly striving to do things better and to improve our processes. This results in greater efficiencies and better solutions for our clients. Service is one of the factors that makes us different. Here’s how we deliver it. At Fero, we truly understand manufacturing and the process of assembling a finished product. Our Account Managers and Engineers understand the principles of lean manufacturing, and apply them to your projects and solutions. Our Process Team understands the importance of getting our delivery right in order to enhance our customers’ processes. To us, customer service is all about problem solving, consistency and flexibility. We know that manufacturing is rarely straightforward and that we need to remain flexible to our clients’ changing needs. We know that NZ manufacturing will only lead the world if it remains flexible. We understand why our clients needs us to remain adaptive to their changing needs. So, when an Engineering Change Notice comes through, we react quickly and make changes quickly. We maintain systems and processes to allow us to be this adaptable because we know its vital to our clients and we believe it’s our real point of difference. At Fero, we maintain capacity each week in order to remain flexible to our client’s changing and dynamic needs. We like to consider ourselves big enough to deliver, yet small enough to care. With a team of 60+ staff dedicated to delivering a quality product to our customers, we have the scalability to handle jobs of any size. With our additional Asian partners, we know we’ve got our customers covered, whatever their production requirements. We work with a number of large multinational companies, with branches here in NZ, who are often initially surprised at our ability to handle large projects quickly and cost effectively and LOCALLY. We often have greater capacity than our customers’ in-house teams. We’re often able to increase our scope of work to deliver sub assembly solutions that greatly speed up the assembly of finished products, and so iron out some of those manufacturing bottle-necks! We work in partnership with our clients, always looking to the long term relationship rather than simple short term profits. By supporting scalable manufacturing we allow our customers to start small but then grow quickly when they need to – all the time maintaining the same quality whilst driving costs down as volume increases. Design led thinking is critical in manufacturing and assembly. Our team of 5 engineers are often called on to problem solve, and frankly there’s nothing they like better. Customers often come to us with a concept and ask us to come up with a manufacturing or assembly solution. We can take a project from idea through to final saleable product, working through all the issues along the way, so you can focus on the sales and the marketing! In some ways it’s easy to create a product, but the difficult thing is to create it to be commercially viable. For that the solution needs to be simple and cost effective. Our intimate knowledge of assembly and process improvement means we’re often asked to review products with Design for Manufacture in mind. Rarely can any one individual take credit for an idea or the delivery of a solution. We work together with other suppliers and agents to deliver a total solution. And we work in partnership with our clients to ensure mutual understanding and agreed delivery. At Fero, we’re firm advocates of Collaborative Manufacture. We’ll work with customers AND their suppliers AND our partners to provide a total solution. If we don’t have the core requirements in-house then we’ll work with our partners to source, manufacture and assemble as required, taking responsibility for the whole project and for our partners too. Its these relationships and partnerships that allows us to deliver solutions and source products well outside of the the capabilities of any other NZ company. From PCBA to injection molding, metal work to compliance, we’re able to deliver a cost effective solution and manage the entire process from start to finish. This means you only need deal with one company, one order and one invoice. It’s important to have a deep understanding of our clients’ business. We can help in sourcing, specifying and producing products that meet the needs of their application. We can advise on raw materials that have been designed and certified for the exact application they’re being used. To our customers, it means they get the right solutions, certified. Fero has been in business a while and we’ve developed relationships with suppliers across the globe. From electronic components, wire and raw materials to specialised connectors, we can cover every need. Not only do we know what products work best but we know what’s easily available and can be sourced with short lead-times when necessary. Customers tend to use us early in the design process to keep their operation running smoothly. At Fero, we work with a number of international companies that are required to operate under strict international compliance requirements. We produce to UL requirements in all our work, and fully certify all products required under this standard. We qualify and audit all our major international suppliers and partners to ensure similar compliance. Take a look at our Compliance page for details of all our policies.